The result of the Scottish Referendum wasn't as clear cut as the Unionists would have you believe, hence the hysteria over the prospect of a second referendum. When a second referendum does take place, they know things won't be as easy second time round. Promises they made at the time have already been broken and the Vow promising Devo-Max has failed to materialise, so people are now far more cautious. They have shot their bolt and know they can't use the same scare tactics again to win a second referendum. When it comes to politics within the UK, and Scotland in particular, you can no longer believe a word the BBC says. The BBC's worldwide reputation for news impartiality is now totally discredited. They are not a news corporation, but a mouthpiece for the Westminster Government, putting out Unionist propaganda. 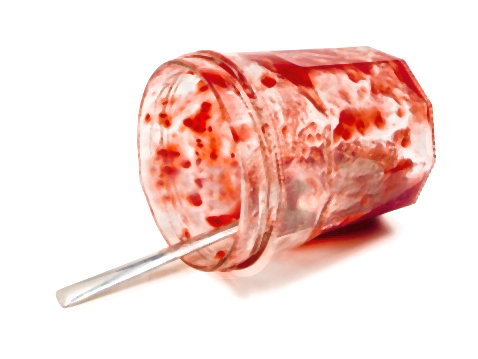 No, there isn't going to be a jam shortage, even the Better Together Campaign, with their dubious funding, haven't scraped the bottom of the barrel, or should that be jam jar, with a scare story as ridiculous as that. Well, not yet anyway. No jam tomorrow refers to the broken promises made by Unionist politicians in the 1979 Devolution Referendum, if Scotland voted No, we would get a better deal. This promise was duly broken by Margaret Thatcher who reaped nothing but havoc in Scotland, decimating our industries and casting generations onto the scrap heap. Today, Scotland is still suffering from this betrayal by a Westminster Government. Today we are being promised exactly the same thing by the Better Together Campaign, but they can't specify what it will be, as they aren't a political party. They claim it is up to the political parties to spell out what they propose to do in the event of a No vote. 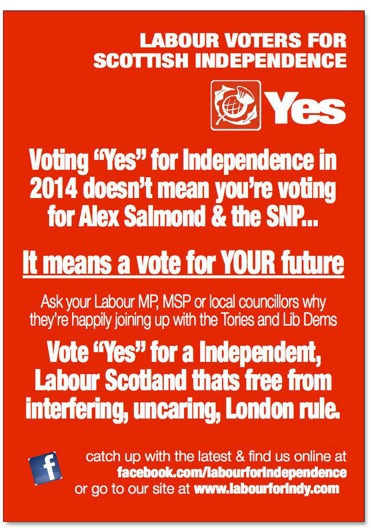 A No vote doesn't mean we will get Devo-Max, like a lot of people think. No UK Government is ever going to grant Scotland anywhere near Devo-Max because there would be no point to the union if they did. The whole idea of the union is for Westminster to control and spend Scotland's assets and revenues. 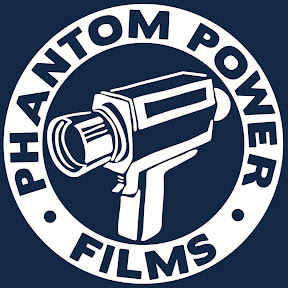 Without this power the whole concept of the union is pointless and worthless to them. The Labour Party don't support Devo-Max, and senior figures within Labour are hostile to any proposals for financial powers for the Scottish Parliament. All that they are proposing is tinkering with the existing 2012 Scotland Act, which adds little to the powers Holyrood inherits anyway in 2016. The Conservatives can't make specific proposals nor to commit their party to a detailed plan for further devolution. David Cameron has already stated that Scotland will receive no further tax powers, so requests for Air Passenger duty to be devolved will be ignored. To appease English voters, who oppose Scotland getting extra powers for voting No, backbench Tory MP's have stated they will block any more powers being devolved to Scotland. Regardless of what is agreed by opposition parties in the Scottish parliament, any new powers will have to be agreed by Westminster parties and all indications are, Scotland will receive little, if any extra powers from Westminster. The extra powers initially proposed by the Calman Commission were subsequently watered down, as Westminster thought they were giving too much away to Scotland. 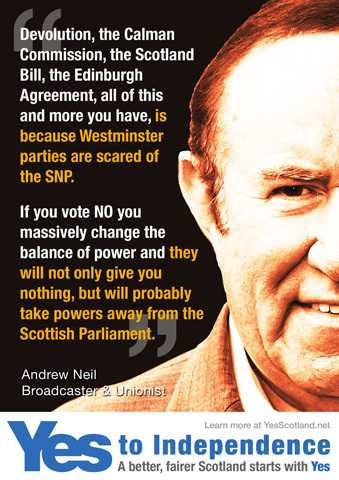 Any extra powers promised now will follow the same route, and there is nothing to stop the House of Lords removing powers from the Scottish parliament, as they have done in the past. We won't be able to raise any extra money under any new powers promised by Westminster, so we won't be better off, and will still be reliant on the pocket money Westminster decides to give us. All three Unionist parties have indicated they would review the Barnett formula after the next UK general election. For every £1 Scotland sends to Westminster, we only receive 70p back, a Yes vote would means we get the whole £1 to spend. It has taken 17 years for extra powers to be devolved to the Scottish parliament, how long will Westminster take to deliver the extra powers promised after a No vote? Westminster are actively working against Scotland's interests with the Devolution Unit of the Foreign and Commonwealth Office changing its role from promoting the Scottish Governments interests, to now being used against it. As the scaremongering stories from Westminster increase, even foreign commentators are noticing how ridiculous they are. If you just relied on the MSM and the BBC, nobody would really know what the facts actually are, the BBC in Scotland are blatantly pro-Union/Labour and anti-Independence/SNP, they will do anything to prevent the people of Scotland from hearing the truth, even removing comments from First Minister Alex Salmond from news bulletins. Only in Scotland have the BBC removed the ability to allow people to comment on political articles on their website, to allegedly improve debate! They brush over good news, if they actually decide to report it at all, and put a negative spin on items they can't avoid reporting on. They rarely mention business trips undertaken by the First Minister to promote Scotland. The BBC is supposed to be impartial, but they have a blatant Unionist agenda and operate with impunity. BBC Scotland is becoming no more than a political mouth piece for the No campaign. To highlight the ridiculous stories about the Alex Salmond, the SNP and Scottish Independence from the BBC and Reporting Scotland, the spoof website BBC Scotlandshire was created in the style of the real BBC website. Unfortunately the ridiculous spoof stories they used to highlight real issues were actually believed by people, who thought they were on the real BBC website and they had to read the stories twice to realise they weren't real. Scottish Independence Referendum Guide - Contains very good links. Looking at these sources of information, will open your eyes to news that the MSM and the BBC prefer you not to know about, as they are all pro-Union. This is not a Union of Equals as always portrayed by Unionists. During World War II, there were secret plans by Westminster to sacrifice Scotland to the Nazi's to preserve England, so it just shows you how little they care about us, yet claim we are "Better Together". And it is definitely not an equal union when the 139 Tory MP's in the South East of England can always out vote the 59 MP's elected in Scotland and impose policies like the Bedroom Tax on us. What else will they impose on us in the future if we vote No? 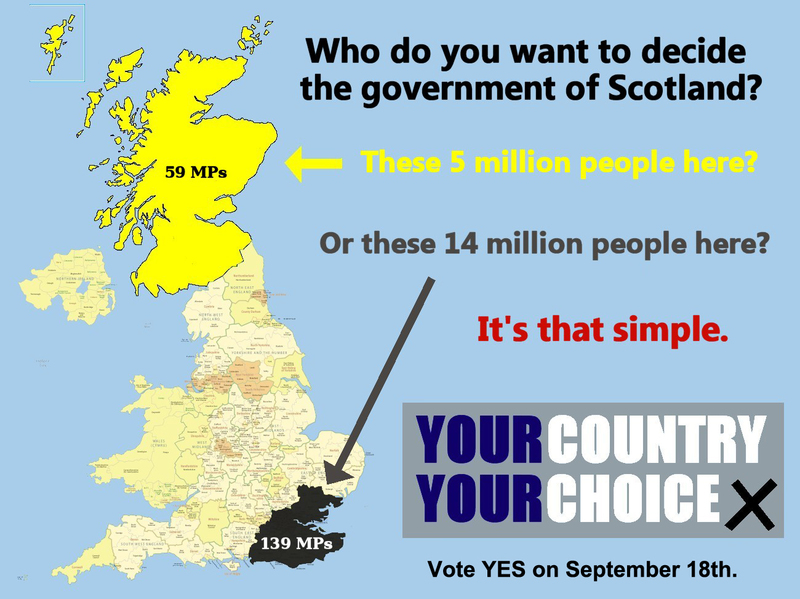 A No vote will not make Scottish Independence go away, it will happen one day, it is just a matter of when. The Westminster Government know this, that is why you hear the scare stories like the oil running out. True it is running out, in about 50 years time according to some estimates with the Atlantic oil fields now coming into production and new technology extending the life of existing fields, but that is also true for all the other rich oil producing countries around the world. That doesn't seem to affect their economies, yet Scotland is the only poor, developed oil producing country in the world. This is in stark contrast to our neighbour Norway. Scotland has not benefited from North Sea oil like Norway under Westminster rule, and there is no indication at all that we ever will. Scotland can easily afford to be Independent, even though we are constantly told we would have to increase taxes to afford it, which clearly isn't the case. 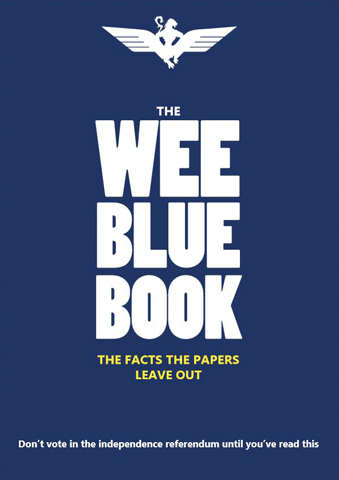 Using Westminster's own GERS figures, Ivan McKee analyses the figures and shows that Scotland actually pays more to Westminster than we currently get back. This figure equates to £4.4Billion or more than £800 per person in Scotland. No wonder Westminster claim we are "better together" and want to hang onto us, they can't afford to go it alone. John Jappy, a retired Senior Civil Servant in the Inland Revenue, explains the truth behind the UK's finances and the significance of Scotland's oil to both the UK and an Independent Scotland's future. Westminster knows the value of Scottish oil to the UK economy and that is why the McCrone Report was classed as Secret and buried away in the archives for 30 years to stop the people of Scotland finding out the truth, thus keeping the benefits of Scottish oil for themselves. The UK Government is effectively bankrupt and needs the oil revenues that rightly belongs to Scotland to keep the UK afloat. That is why they downplay the value of Scottish oil in an attempt to make the Scottish economy look worse than it actually is, yet in 1999 on the eve of the creation of the Scottish Parliament, Westminster secretly reclassified 6000 square miles of Scottish sea as English waters in an attempt to keep the oil for themselves. There is nothing to be scared of voting for Independence, it is a No vote that you should really be worried about. If Scotland as a nation votes No then Scotland will be voting to end its status as a nation once and for all. Never again will Westminster allow the people of Scotland a chance to vote on their own constitutional status within the UK. The only reason Scotland is getting this chance is because the SNP caught them on the hop by achieving what was believed to be the impossible at a time when there is a gap in the legal constitutional construction of the UK. A gap which will be quickly closed with a No vote. This is our chance to take control of our own destiny and create the country and society we want to live in, and pass onto future generations. To date, 53 countries have gained independence from the UK, 47 since the end of World War II, and not one of them has seen the need to become dependent again. Let's make Scotland number 54, vote Yes in 2014.